A jailed American neo-Nazi leader has boasted that he met the banned British fascist group National Action outside Buckingham Palace. Brandon Russell, who was jailed for five years after police found bomb-making materials in his flat, is a co-founder of Atomwaffen, an extremist network whose young followers have been implicated in a string of murders. The discovery of a transatlantic alliance between young Hitler enthusiasts comes days after Mark Rowley, Britain’s most senior counterterrorism officer, warned that violent British white supremacists were starting to make international connections. Russell used his nickname “Odin” on the neo-Nazi Iron March forum to describe his tour of Britain with National Action in July 2015. 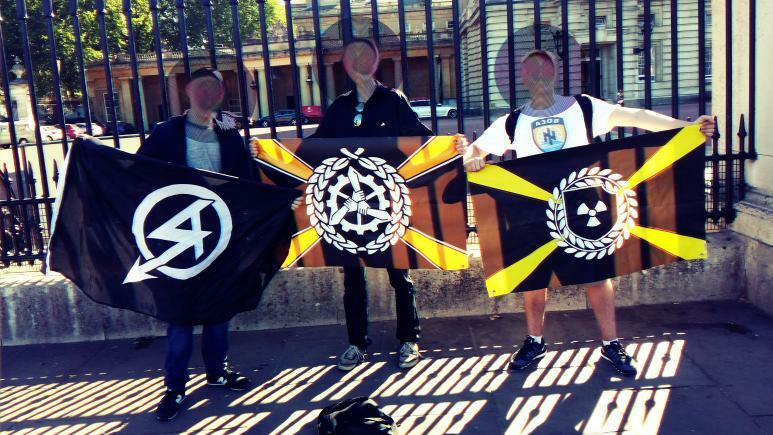 He stopped at sensitive locations such as Buckingham Palace where Atomwaffen and National Action members posed with their respective flags. A third flag unfurled there represented Iron March. National Action’s flag incorporates the symbol of Sir Oswald Mosley’s Union Movement in which his son Max, now a privacy campaigner, was a prominent activist. Russell met members of National Action, including Ben Raymond, its co-founder, just after one of the organisation’s supporters, Zack Davies, had been convicted for trying to behead an Asian dentist in Mold, north Wales. 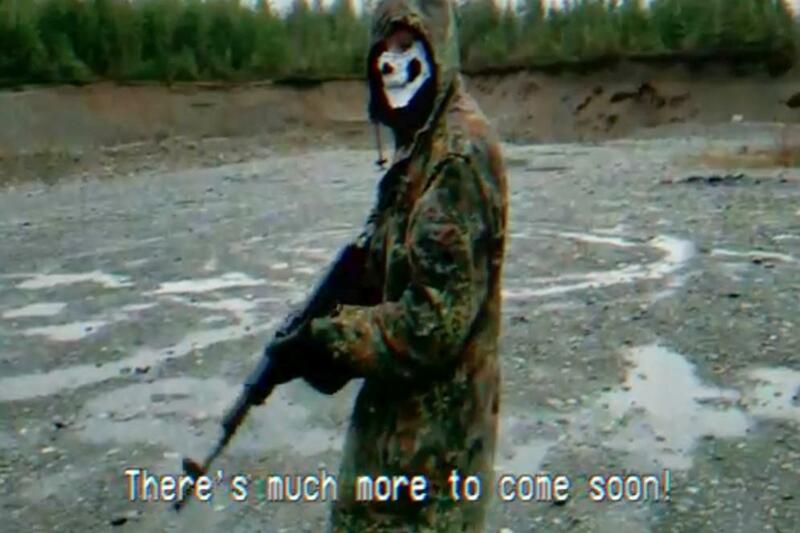 Atomwaffen, which means “atomic weapon” in German, was formed in 2015 and is estimated to have only 80 members scattered around the United States. The extremist group was co-founded by housemates Russell, now 22, and Devon Arthurs in Tampa, Florida, in 2015. Russell was sentenced to five years in prison in January after police found bomb-making material at their home. Arthurs told authorities that Russell had been planning to blow up a nuclear power plant near Miami. Police stumbled on Russell’s home-made explosives when they were called to the flat last May after Arthurs, 18, shot dead their housemates Andrew Oneschuk, 18, and Jeremy Himmelman, 22. Samuel Woodward, 20, a supporter of Atomwaffen, has been arrested over the alleged hate crime murder of Blaze Bernstein, 19, a former classmate who was gay and Jewish, in Orange County, California, in January. In December, Nicholas Giampa, 17, who was influenced by Atomwaffen’s online literature, allegedly shot dead his girlfriend’s parents in Reston, Virginia, after they convinced her to ditch him for being a neo-Nazi. Atomwaffen was banned this week by YouTube “due to multiple or severe violations of YouTube’s policy prohibiting hate speech”. National Action was proscribed as a terrorist organisation by Amber Rudd, the home secretary, in December 2016 after the murderer of Jo Cox gave its slogan “Death To Traitors, Freedom For Britain” as his name in court. National Action was co-founded in 2014 by Ben Raymond, 28, a former double-glazing salesman from Bognor Regis, and Alex Davies, 21, from Swansea. Scottish Dawn, a front group created by Raymond, appeared on the streets in Scotland last year but has also now been banned.